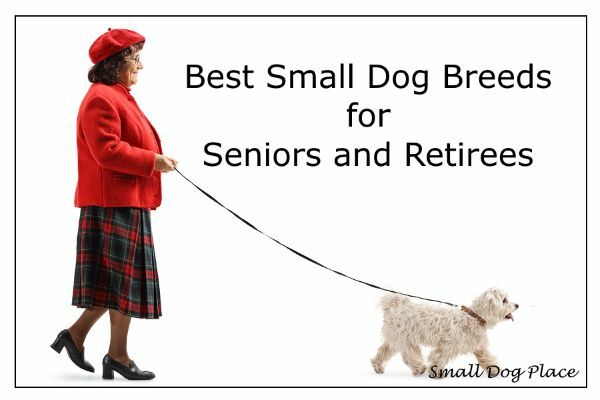 Would you agree that Small is usually better when considering which breed is best for senior citizens. Admittedly, we’re a little biased around here, but there’s lot to be said about the perfect dogs for senior citizens and retirees. Big or small.. The warmth, companionship, love and entertainment that dogs provide can make all the difference in the life of an older person. 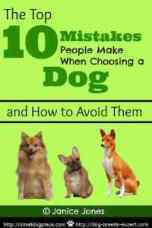 You are welcome to skip the introduction and go directly to our recommendations for the best dog breeds for seniors. What is better than a companion who is always cheerful, eager to please, and thinks you are the best person in the entire world? Who could resist a companion that gives us unconditional love 24/7 and asks nothing in return but a bowl of food, a drink of water, a warm lap and a few caresses, now and again? Why spend hundreds on expensive entertainment when you can have a companion that makes us smile and provides free entertainment? We know that dog ownership can benefit humans in many ways, all of which are vitally important as we reach our senior years. For at least 15,000 years and perhaps much longer, dogs have lived side by side humans. There must be something to this human--dog bond. According to the Centers for Disease Control and Preventions, there are well documented benefits for owning a dog or other pet. Lower rates of depression by elevating the levels of serotonin and dopamine. Pets have been shown to build self-esteem, increase mental alertness and lift the spirits of people with Alzheimer's disease. 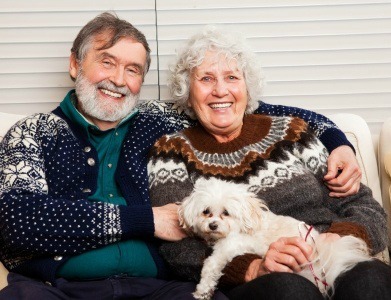 Seniors also tend to care for themselves better when they own a pet. Don’t! If you are in a position to purchase or adopt a dog for your parent or grandparent, please stop and ask them if they really want a pet. Owning a dog may be the best solution to loneliness, but if the senior does not want one or does not feel they are capable of caring for a dog, you will be adding additional burdens and stress into their life. A person should always choose their own dog. Giving the gift of a dog is never a good idea. There will always be bonding issues and the possibility of hard-feelings on the part of the senior. by all means, Show them this Page! What is the life expectancy of the breed you are considering? How old will you be when the dog reaches his senior years? Small dogs generally live longer than big dogs. What are the physical needs of the breed you are contemplating? Are they a very active breed requiring several daily walks? What are the specific needs of the breed you are anticipating acquiring such as grooming and training? How will you manage a dog under foot, if ambulation is a problem for you? If you are in a wheelchair, is the dog you are considering able to move out of the way. Do you have the resources to pay for vet bills, grooming and supplies? Do you travel? Will you take the dog with you or hire a pet sitter, ask a friend or board the pet. Many seniors who have owned pets all of their lives do not adequate consider the difference between adopting a dog at the age of 35 and 65. Many older people who crave the opportunity to love a dog will seek out opportunities to adopt an older dog from a shelter, rescue or even a breeder who is retiring their breeding dogs. Adults are beyond the crazy puppy stage and many have already been trained to walk on a leash, obey basic commands and eliminate in appropriate places. This is not always the case, so it is important to learn as much about the background of any dog you are considering as you can. Even well trained adult dogs will have an adjustment period and need time and patience to learn new routines, schedules and habits of a new person. Puppies bond quickly to new people and training is easier with a young puppy. You can watch your dog grow up and mold him into the type of dog that is right for you. Puppies are cute and often do silly things that entertain us. Have tons of energy and need more outlets for that energy. There will be no surprises about behavior or temperament if adopting from a reputable honest agency. Adults are calmer and normally do not have the energy level that they had as puppies. They may already have some basic skills and housebreaking. Adults may need a longer period to adjust to a new home and owner. They may have health issues that contribute to the costs of ownership. Senior Dogs: A great Choice! Senior dogs can be a great choice. Many people shy away from a senior dog, but they deserve just as much love and attention as any younger dog. They are the least active, often the most appreciative and loving dogs, but may have health problems. Often health concerns can be as simple as giving the older dog a pill once a day but can also include special vet visits and more elaborate home care. Veterinary bills can be an issue, but there is health insurance for pets that help with these costs. Most of all, senior dogs have so much love to give and just the act of adopting one knowing you may be his/her last chance provides rewards greater than words can express. There are four reasons why choosing a small dog over a larger dog may make sense for older people: Safety Concerns, Portability, Ease of Cleanup and Affordability. Let's take a look at each. Falls are always a concern as we age and the last thing worry about is the possibility of falling as a result of your four legged friend. You are less likely to trip over larger dogs, but most adult small dogs know how to get out from under the foot of a walking human. Puppies are another story and some take longer than others to get out from under foot. Large dogs can be challenging even for young people to manage. A poorly trained large dog that jumps on people can be a safety issue to a senior. Balance is not always as good with seniors as it is with younger people and it doesn’t take much to lose one’s balance and fall. A well trained dog is a joy to take on a walk, but dogs are not born knowing how to walk nicely. Training a small dog may be easier than a strong large dog. Even if you are not a world traveler, there is a good chance you will want to include your dog in your activities. Small dogs are easier to pick up and take places including visits to the veterinarian, grooming salon or on a cross country vacation. Many will fit easily under an airline seat when you travel. Car travel is easier and many hotels place a limit on the size of dog you can keep in your room. Let’s face it, there is err, uh, less clean up after a small dog versus a large dog. No one likes to think about this chore but unless you can train your dog to use a human toilet, you will be doing a bit of cleanup. Small is almost universally less expense than large by sheer size alone. From grooming and boarding, to dog food costs and supplies, the larger the dog, the more expensive it becomes. Many seniors and retirees are on a fixed income but still manage to make room in the budget not only for dog care, but indulge their pampered pet with extra luxuries they may not give themselves. So, here is my list of the Top Ten Best Dog Breeds for Seniors, not in any particular order. Use this list along with the recommendations above to find a breed that is right for you. All breeds listed on this page are purebred. There are many hybrids and mixed breeds that would make perfect pets for a senior. Don't rule any of those great designer dogs out when making your choice. They require little in the way of grooming which is good for some one who doesn't enjoy brushing all the time. They will not need to go to the groomers every six weeks, so their cost is less than a longer haired dog. 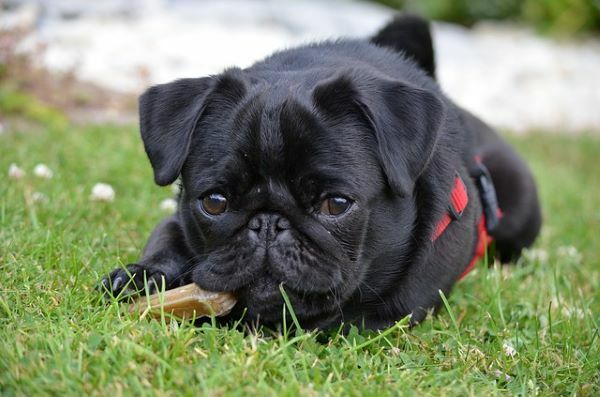 Pugs are also a relatively low energy dog and enjoy the opportunity to join their owner on the couch for an afternoon nap or take a short leisurely walk in the neighborhood. 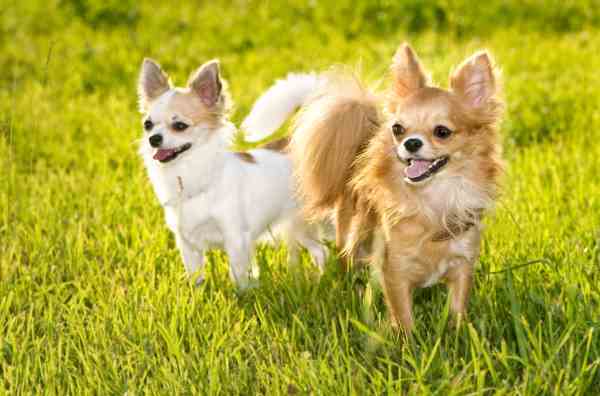 Chihuahuas have the advantage of being very small which makes them easy to carry and transport and travel with. Short haired chihuahuas do not require much grooming and even the longer haired varieties are not as demanding as some of the other long haired breeds. They make great lap dogs and can easily fit in your purse if you want them to tag along when you're out and about. Beagles have long been a favorite of retirees because of their cheerful nature, smaller size, and easy to groom coat. 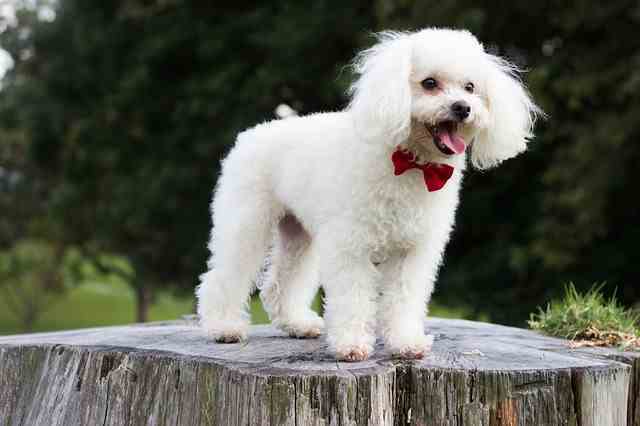 If grooming really is not your thing, consider one of the short-haired small dog breeds. They love daily walks and would be perfect for the active retiree. 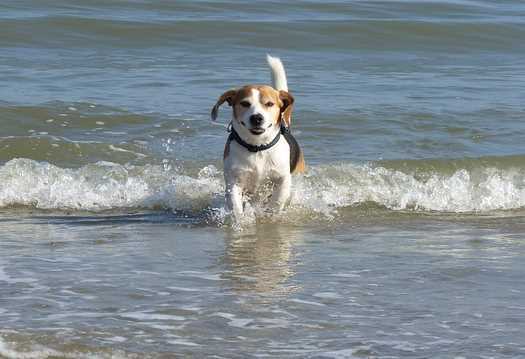 Though grooming needs are minimal, an occasional bath may be needed as some beagles tend to have that "doggie smell." Beware of their barking tendencies so if you live in an apartment, this may not be the best choice. The Havana Silk Dog makes a great companion for a senior or retiree couple who want a cheerful, happy dog that is likely to amuse. At only 7 to 13 pounds, they are small and easy to manage. They train fairly easy and do not require much exercise making them one of the best dog breeds for seniors. A walk is always welcome, but just following you around the house may be all the exercise your dog needs. Grooming needs do need to be taken into consideration as these dogs need to be brushed regularly and professionally groomed about every 2 months. 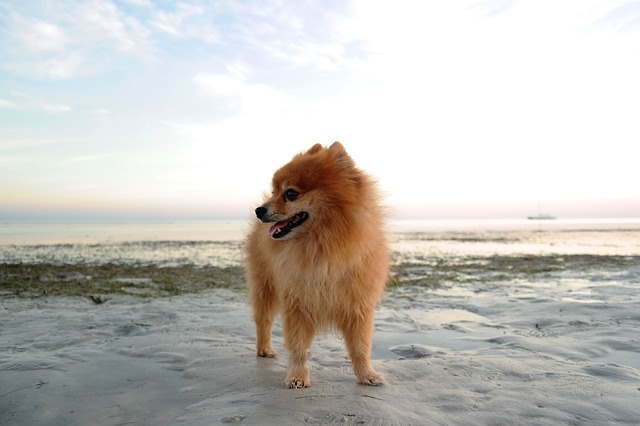 If you don't mind brushing and combing, usually daily but at least several times a week, a Pomeranian might be an ideal choice for a senior. They are small, loyal, and love to find room on their owner's lap for a little nap. At only 3 to 7 pounds, they are easy to handle and can be trained fairly easily. Their happy cheerful temperament can't help but put a smile on your face. 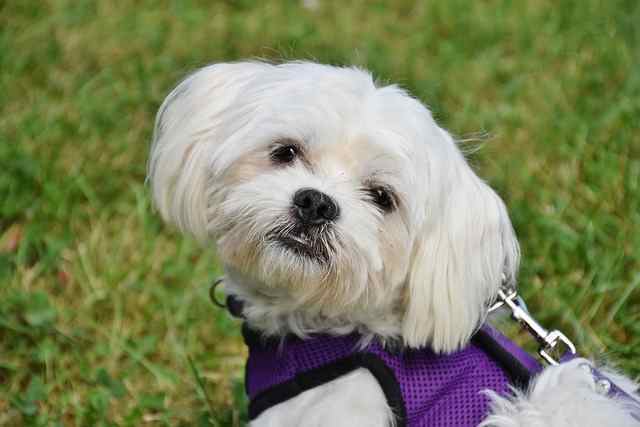 If you are looking for a sweet little fluffy white dog, the Maltese might be just what you are looking for. Very loving and affectionate, Maltese dogs do require a lot of grooming and a visit to a professional groomer about every two months. 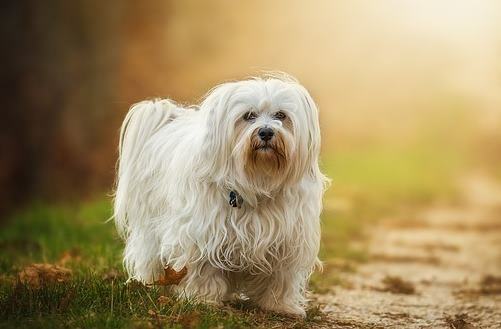 At 4 to 7 pounds, Maltese dogs are lightweight and easy to carry. You could even find a carrier or purse that would help you when you are out and about or when you travel. An added bonus is they are good for allergy sufferers. Normally a very small dog, some Yorkies can get a bit bigger than the breed suggests, so if tint is what you want, be sure to inquire about this when adopting. If you prefer to get a puppy, ask about the size of the parents. 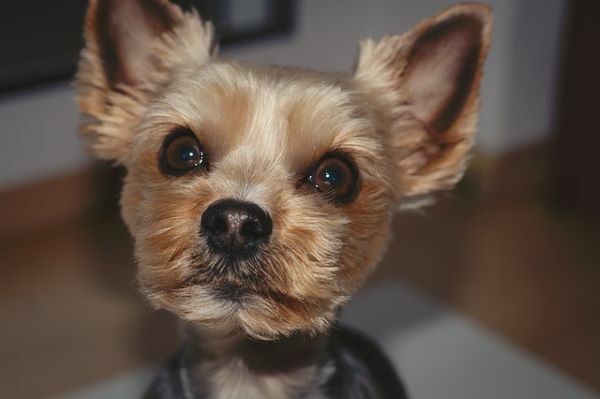 Yorkies do require brushing and grooming but their single hair coat does not mat as easily as some breeds so a grooming session two or three times a week is normally enough. They also make great choices for those who suffer from allergies as they are more hypoallergenic than most. 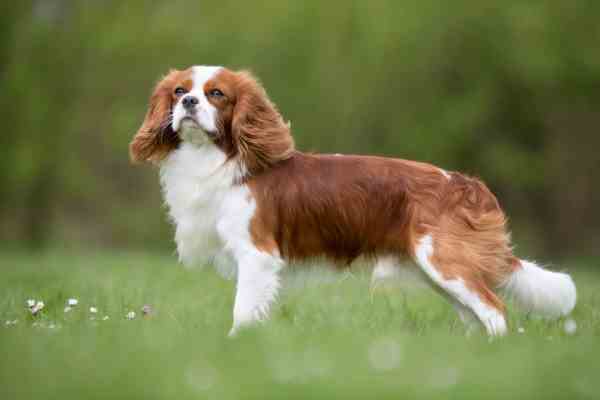 While not as small as many on this list, Cavies are still small enough at 11 to 18 pounds to manage comfortably by most dog owners. When you look into the large dark eyes, you will immediately know why these dogs are so popular and why they make one of the best dog breeds for seniors. They do have their fair share of grooming needs, but their sweet, quiet nature makes them a perfect choice for retirees, especially those that enjoy a dog snuggled up keeping their laps warm. If you'd like a low energy dog that still enjoys a daily walk, the Shih Tzu should fill that bill. They do have some high maintenance needs in the grooming department, but much of that can be taken care of every 6 weeks when they visit the professional groomer. Between sessions, though it will be important to brush and comb their hair regularly. They are easy to train for basic commands, but housebreaking takes a little longer. Their favorite activity is to curl up next to you or on your lap. As dogs go, they are not as yappy as most making them a good choice if you live in an apartment. 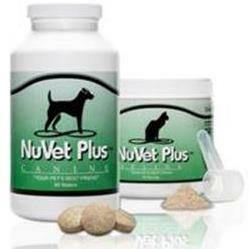 This breed is a great choice if you are a retiree and also suffer from allergies. They are more hypoallergenic than most. Poodles are one of the easiest small dog breeds to train so if you enjoy training, this is a good breed to consider. They make good therapy dogs also if that is something you have always wanted to try. 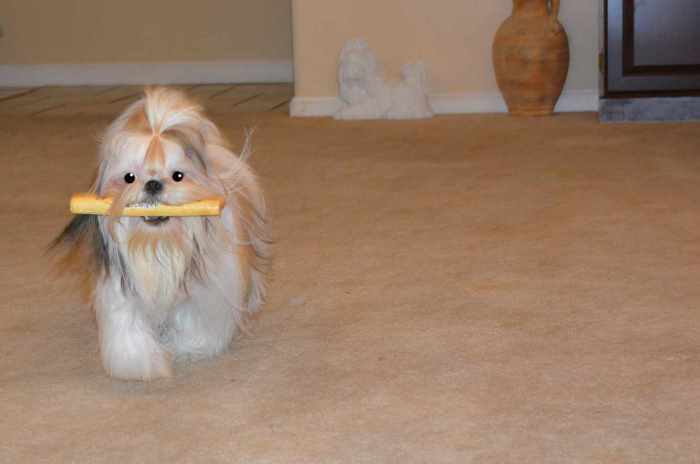 Grooming will require your time and you will need to factor in professional grooming visits every 6 weeks to 2 months. Poodles are also known for being good watch dogs and will bark to alert you that someone is coming. They are not a breed known to bark for no apparent reason though, so may make a good apartment dog too. Safety should always be on your mind at any age, but especially as we get older. The thought of tripping and falling over a small dog is real. Bending, losing your balance, or slipping on a icy pavement while walking your dog are all real threats. Here are a few more senior dog owner safety tips to check out. Dogs are still the number one choice for pet ownership with an estimated 54.4 million households owning a dog. Cats are owned by 42.9 million households in the U.S.